A call to Tassos Papantoniou at Torrance Yachts brings news of a €700,000 price reduction on the 40m motor yacht Nisor (43m if you include her retractable bowsprit). She has a steel hull and GRP superstructure, and her 2.9m draft offers amazing stability. Tassos explains that she is perfect for families, as the VIP cabins offer extra accommodation for children, allowing her to cater for up to 16 guests. 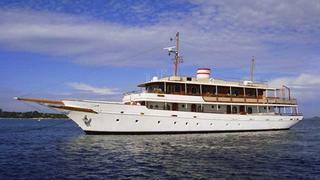 She underwent an extensive refit in 2005 which included the replacement of her engines, and is in excellent condition. The asking price of Nisor is now down from €6.2 million to €5.5 million.